Hebrews 4:12 "For the word of God is living and active and sharper than any two-edged sword, and piercing as far as the division of soul and spirit, of both joints and marrow, and able to judge the thoughts and intentions of the heart." It is fundamentally important that humans understand that they are a spiritual being, have a soulish nature, and live in a physical body. The Bible clearly delineates this. The articles in the previous tab and below deal with this concept. As well, this is more fully discussed in the booklet "Defending the Faith in the Last Days" see link below. Scripture from the NASB with permission. To properly understand how each of mankind derive their worldview and values of life it is essential that the triune nature of man be appreciated. 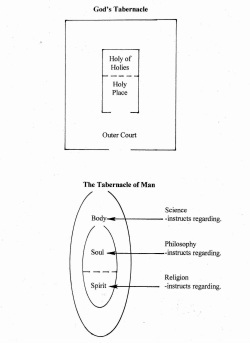 Man has input into his concept of self from the spirit, mental/emotional, and physical relm. This has been further discussed in the booklet "Defending the Faith in the Last Days". See link below. Religion (which impacts the spirit), philosophy (the soul), and science (the flesh) overlap to impress upon a person a certain worldview. The person can volitionally accept or reject the input from any of these areas, and emphasize one over the other. But all of mankind practice religion, philosophy, and science. For the Christian an understanding of the ceremonies, utensils, and parts of the Tabernacle or Temple of God can also help them better understand the triune nature of themselves. The Booklet Defending the Faith in these Last Days (click button below) has an expanded explanation of these concepts. You can click back once on button for the "Interfacing of Religion, Philosophy, and Science" or see the pdf file directly below for summary of these concepts.